This article is about the operating system. For the web browser, see Google Chrome. Chrome OS is a Linux kernel-based operating system designed by Google. It is derived from the free software Chromium OS and uses the Google Chrome web browser as its principal user interface. As a result, Chrome OS primarily supports web applications. Chrome OS is only available pre-installed on hardware from Google manufacturing partners, but there are unofficial methods that allow it to be installed in other equipment. An open source equivalent, Chromium OS, can be compiled from downloaded source code. Early on, Google provided design goals for Chrome OS, but has not otherwise released a technical description. Chrome OS was initially intended for secondary devices like netbooks, not as a user's primary PC. While Chrome OS supports hard disk drives, Google has requested that its hardware partners use solid-state drives "for performance and reliability reasons" as well as the lower capacity requirements inherent in an operating system that accesses applications and most user data on remote servers. In November 2009 Matthew Papakipos, engineering director for the Chrome OS, claimed that the Chrome OS consumes one-sixtieth as much drive space as Windows 7. The recovery images Google provides for Chrome OS range between 1 and 3 GB. On November 19, 2009, Google released Chrome OS's source code as the Chromium OS project. At a November 19, 2009, news conference, Sundar Pichai, at the time Google's vice president overseeing Chrome, demonstrated an early version of the operating system. He previewed a desktop which looked very similar to the Chrome browser, and in addition to the regular browser tabs, also had application tabs, which take less space and can be pinned for easier access. At the conference, the operating system booted up in seven seconds, a time Google said it would work to reduce. Additionally, Chris Kenyon, vice president of OEM services at Canonical Ltd, announced that Canonical was under contract to contribute engineering resources to the project with the intent to build on existing open source components and tools where feasible. 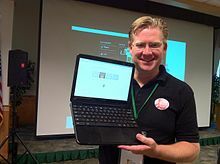 In 2010, Google released the unbranded Cr-48 Chromebook in a pilot program. The launch date for retail hardware featuring Chrome OS was delayed from late 2010 until the next year. On 11 May 2011, Google announced two Chromebooks from Acer and Samsung at Google I/O. The Samsung model was released on 15 June 2011, but the Acer was delayed until mid-July. In August 2011, Netflix announced official support for Chrome OS through its streaming service, allowing Chromebooks to watch streaming movies and TV shows via Netflix. At the time, other devices had to use Microsoft Silverlight to play videos from Netflix. Later in that same month, Citrix released a client application for Chrome OS, allowing Chromebooks to access Windows applications and desktops remotely. Dublin City University became the first educational institution in Europe to provide Chromebooks for its students when it announced an agreement with Google in September 2011. By 2012, demand for Chromebooks had begun to grow, and Google announced a new range of devices, designed and manufactured by Samsung. 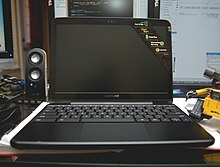 In so doing, they also released the first Chromebox, the Samsung Series 3, which was Chrome OS's entrance into the world of desktop computers. Although they were faster than the previous range of devices, they were still underpowered compared to other desktops and laptops of the time, fitting in more closely with the Netbook market. Only months later, in October, Samsung and Google released a new Chromebook at a significantly lower price point ($250, compared to the previous Series 5 Chromebooks' $450). It was the first Chromebook to use an ARM processor, one from Samsung's Exynos line. In order to reduce the price, Google and Samsung also reduced the memory and screen resolution of the device. An advantage of using the ARM processor, however, was that the Chromebook didn't require a fan. Acer followed quickly after with the C7 Chromebook, priced even lower ($199), but containing an Intel Celeron processor. One notable way which Samsung reduced the cost of the C7 was to use a laptop hard disk rather than a solid state drive. In April 2012, Google made the first update to Chrome OS's user interface since the operating system had launched, introducing a hardware-accelerated window manager called "Aura" along with a conventional taskbar. The additions marked a departure from the operating system's original concept of a single browser with tabs and gave Chrome OS the look and feel of a more conventional desktop operating system. "In a way, this almost feels as if Google is admitting defeat here", wrote Frederic Lardinois on TechCrunch. He argued that Google had traded its original version of simplicity for greater functionality. "That’s not necessarily a bad thing, though, and may just help Chrome OS gain more mainstream acceptance as new users will surely find it to be a more familiar experience." Lenovo and HP followed Samsung and Acer in manufacturing Chromebooks in early 2013 with their own models. Lenovo specifically targeted their Chromebook at students, headlining their press release with "Lenovo Introduces Rugged ThinkPad Chromebook for Schools". When Google released Google Drive, they also included Drive integration in the next version of Chrome OS (version 20), released in July 2012. While Chrome OS had supported Flash since 2010, by the end of 2012 it had been fully sandboxed, preventing issues with Flash from affecting other parts of Chrome OS. This affected all versions of Chrome including Chrome OS. Up to this point, Google had never made their own Chrome OS device. Instead, Chrome OS devices were much more similar to their Nexus line of Android phones, with each Chrome OS device being designed, manufactured, and marketed by third party manufacturers, but with Google controlling the software. However, in February 2013 this changed when Google released the Chromebook Pixel. The Chromebook Pixel was a departure from previous devices. Not only was it entirely Google-branded, but it contained an Intel i5 processor, a high-resolution (2,560x1,700) touchscreen display, and came at a price point more competitive with business laptops. By the end of 2013, analysts were undecided on the future of Chrome OS. Although there had been articles predicting the demise of Chrome OS since 2009, Chrome OS device sales continued to increase substantially year-over-year. In mid 2014, Time Magazine published an article titled "Depending on Who's Counting, Chromebooks are Either an Enormous Hit or Totally Irrelevant", which detailed the differences in opinion. This controversy was further spurred by the fact that Intel seemed to decide Chrome OS was a beneficial market for it, holding their own Chrome OS events where they announced new Intel-based Chromebooks, Chromeboxes, and an all-in-one from LG called the Chromebase. Seizing the opportunity created by the end of life for Windows XP, Google pushed hard to sell Chromebooks to businesses, offering significant discounts in early 2014. In March 2014, Google hosted a hacking contest aimed at computer security experts called "Pwnium". Similar to the Pwn2Own contest, they invited hackers from around the world to find exploits in Chrome OS, with prizes available for attacks. Two exploits were demonstrated there, and a third was demonstrated at that year's Pwn2Own competition. Google patched the issues within a week. Although the Google Native Client has been available on Chrome OS since 2010, there originally were few Native Client apps available, and most Chrome OS apps were still web apps. However, in June 2014, Google announced at Google I/O that Chrome OS would both synchronise with Android phones to share notifications and begin to run Android apps, installed directly from the Google Play Store. This, along with the broadening selection of Chromebooks, provided an interesting future for Chrome OS. At the same time, Google was also moving towards the then-new Material Design visual language for its products, which it would bring to its web products as well as Android Lollipop. One of the first Material Design items to come to Chrome OS was a new default wallpaper, though Google did release some screenshots of a Material Design experiment for Chrome OS that never made it into the stable version. In an attempt to expand its enterprise offerings, Google released the Chromebox for Meetings in February 2014. The Chromebox for Meetings is a kit for conference rooms containing a Chromebox, a camera, a unit containing both a noise-cancelling microphone and speakers, and a remote control. It supports Google Hangouts meetings, Vidyo video conferences, and conference calls from UberConference. Several partners announced Chromebox for Meetings models with Google, and in 2016 Google announced an all-in-one Chromebase for Meetings for smaller meeting rooms. In September 2014, Google launched App Runtime for Chrome (beta), which allowed certain ported Android applications to run on Chrome OS. Runtime was launched with four Android applications: Duolingo, Evernote, Sight Words, and Vine. In 2016, Google made the Google Play Store available for Chrome OS, making most Android apps available for supported Chrome OS devices. Google announced in 2018 that Chrome OS would be getting support for desktop Linux apps. This capability was released to the stable channel with Chrome 69 in October 2018, but was still marked as beta. Since 2013 it has been possible to run Linux applications in Chrome OS through the use of Crouton, a third-party set of scripts that allows access to a Linux distribution such as Ubuntu. However, in 2018 Google announced that desktop Linux apps were officially coming to Chrome OS. The main benefit claimed by Google of their official Linux application support is that it can run without enabling developer mode, keeping many of the security features of Chrome OS. It was noticed in the Chromium OS source code in early 2018. Early parts of Crostini were made available for the Google Pixelbook via the dev channel in February 2018 as part of Chrome OS version 66, and it was enabled by default via the beta channel for testing on a variety of chromebooks in August 2018 with version 69. Google's project for supporting Linux applications in Chrome OS is called Crostini, named for the Italian bread-based starter, and as a pun on Crouton. Crostini runs a virtual machine through a virtual machine monitor called crosvm, which uses Linux's built-in KVM virtualization tool. Although Crosvm supports multiple virtual machines, the one used for running Linux apps, Termina, contains a basic Chrome OS kernel and userland utilities, in which it runs containers based on Linux containers (specifically LXD). Chrome OS is built on top of the Linux kernel. Originally based on Ubuntu, its base was changed to Gentoo Linux in February 2010.. In preliminary design documents for the Chromium OS open source project, Google described a three-tier architecture: firmware, browser and window manager, and system-level software and userland services. Chrome OS includes the Chrome Shell, or "crosh", which documents minimal functionality such as ping and SSH at crosh start-up. Google's offering of two open source operating systems, Android and Chrome OS, has drawn some criticism despite the similarity between this situation and that of Apple Inc's two operating systems, macOS and iOS. Steve Ballmer, Microsoft CEO at the time, accused Google of not being able to make up its mind. Steven Levy wrote that "the dissonance between the two systems was apparent" at Google I/O 2011. The event featured a daily press conference in which each team leader, Android's Andy Rubin and Chrome's Sundar Pichai, "unconvincingly tried to explain why the systems weren't competitive." Google co-founder Sergey Brin addressed the question by saying that owning two promising operating systems was "a problem that most companies would love to face". Brin suggested that the two operating systems "will likely converge over time." The speculation over convergence increased in March 2013 when Chrome OS chief Pichai replaced Rubin as the senior vice president in charge of Android, thereby putting Pichai in charge of both. ^ a b Pichai, Sundar (July 7, 2009). "Introducing the Google Chrome OS". Official Google Blog. Google, Inc. Retrieved July 11, 2012. ^ "Stable Channel Update for Chrome OS". April 19, 2019. Retrieved April 20, 2019. ^ Daniel Gagnon (April 18, 2019). "Beta Channel Update for Chrome OS". Retrieved April 19, 2019. ^ Cindy Bayless (April 19, 2019). "Dev Channel Update for Chrome OS". Retrieved April 20, 2019. ^ "Kernel Design: Background, Upgrades". Retrieved September 7, 2011. ^ Google. "Google Chrome OS Terms of Service". Retrieved September 5, 2012. ^ "Chromefy turns any PC into a Chromebook". liliputing.com. November 14, 2018. Retrieved November 27, 2018. ^ "Chrome OS unofficial forks". quickfever.com. Retrieved December 20, 2018. ^ Brodkin, Jon (June 28, 2010). "Google Chrome OS creator takes job at Facebook, announces switch on Twitter". Business Week. Retrieved June 29, 2010. ^ a b c Stokes, Jon (January 19, 2010). "Google talks Chrome OS, HTML5, and the future of software". Ars Technica. Retrieved January 23, 2010. ^ a b "Linux commands". The New York Times. ^ a b c "Developer FAQ". Retrieved December 12, 2009. ^ Mearian, Lucas (November 19, 2009). "Google Chrome OS will not support hard-disk drives". Computerworld. Retrieved November 21, 2009. ^ Sengupta, Caesar (November 19, 2009). "Releasing the Chromium OS open source project". Official Google Blog. Google, Inc. Retrieved November 19, 2009. ^ Yegulalp, Serdar (December 5, 2009). "Google Chrome OS Previewed". InformationWeek. Retrieved December 6, 2009. ^ Rapoza, Jim (December 3, 2009). "REVIEW: Google Chrome OS Developer Edition Provides Intriguing Look at Web-Only Computing". eWeek.com. Retrieved December 4, 2009. ^ Kenyon, Chris (November 2009). "Google Chrome OS and Canonical". Canonical Blog. Retrieved December 14, 2010. ^ Casey Chan (December 7, 2010). "Here's the Cr-48, The First Chrome OS Laptop You Can Never Buy". Gizmodo. Archived from the original on June 25, 2016. Retrieved January 9, 2019. ^ "Google sets "late fall" release for Chrome". Reuters. June 2, 2010. ^ Lawler, Richard (May 11, 2011). "Google unveils Acer Chromebook: $349, 11.6-inches with 6.5-hour battery". Engadget. Retrieved January 9, 2019. ^ Hollister, Sean (May 11, 2011). "Official: Samsung reveals Chrome OS laptop -- the Series 5". Engadget. Retrieved January 9, 2019. ^ Tsukayama, Hayley (June 15, 2011). "Chromebook go on sale". Washington Post. Retrieved January 9, 2019. ^ Reisinger, Don (June 28, 2011). "Acer AC700 Chromebook available, shipping soon". CNet. ^ Richard Lawler (August 9, 2011). "Netflix Watch Instantly streaming now works on ChromeOS, when it's working". Engadget. ^ "Citrix app opens Windows for Chromebook owners". Engadget. Retrieved March 9, 2019. ^ John Kennedy (September 13, 2011). "Dublin City University's five-year plan – Chromebook deal with Google". ^ Leo Kelion (May 29, 2012). "Google Chrome OS computers updated with faster processors". ^ Nathan Olivarez-Giles (October 18, 2012). "Google Debuts $250 Chromebook". Wired. ^ Myriam Joire (November 26, 2012). "Acer C7 Chromebook review: Chrome OS on the cheap, but at what cost?". ^ Lardinois, Frederic (April 9, 2012). "Google's Chrome OS Will Soon Look More Like Windows Than A Browser". Techcrunch. Retrieved June 2, 2013. ^ Sean Hollister (February 4, 2013). "HP's first Chromebook arrives, offers a large screen and a small battery for $329.99". ^ "Lenovo Introduces Rugged ThinkPad Chromebook for Schools". January 17, 2013. Archived from the original on February 5, 2013. ^ Ivan Zhekov (January 18, 2013). "Lenovo unveils the sturdy ThinkPad X131e Chromebook for students". ^ "Stable Channel Updates for Chromebooks". July 11, 2012. ^ Priya Ganapati (March 31, 2010). "Google fires at Apple, Integrates Flash into Chrome Browser". Wired. ^ Emil Protalinski (November 13, 2012). "Google declares Flash is now 'fully sandboxed' in Chrome for Windows, Mac, Linux and Chrome OS". TheNextWeb. ^ "Google unveils its first touchscreen Chromebook Pixel". February 21, 2013. ^ "The Chromebook Pixel, for what's next". February 21, 2013. ^ David Card (December 13, 2010). "Google's Chrome OS: Dead Before Arrival?". ^ Scott Raymond (August 30, 2011). "Chromeboox are dead, they just don't know it yet". ^ Brad Chacos (February 4, 2013). "What's with all the Chromebooks?". ^ Jay Yarow (December 14, 2010). "Google Will Kill Chrome OS Next Year, Predicts Gmail Creator Paul Buchheit". ^ Adam Maguire (November 26, 2009). "Opinion: Will Google's Chrome OS be dead on arrival?". ^ Harry McCracken (May 7, 2014). "Depending on Who's Counting, Chromebooks are Either an Enormous Hit or Totally Irrelevant". Time. ^ Sebastian Anthony (May 7, 2014). "Intel decides that Chromebooks, for some reason, are key to beating ARM in the mobile market". ^ Carly Page (April 9, 2014). "Google jumps on Windows XP's demise with Chromebook for business offer". The Inquirer. ^ Steven J Vaughan-Nichols (March 18, 2014). "Chrome OS security holes found, patched". ^ Cade Metz (May 13, 2010). "Google heats up native code for Chrome OS". The Register. ^ Alan Henry (June 25, 2014). "Chrome OS will Run Android Apps Natively, Sync with Android Devices". LifeHacker. ^ Dan Ackerman (March 3, 2014). "Chromebooks compared: New and upcoming Chrome OS laptops". Cnet. ^ Matt Brian (June 25, 2014). "Google's new 'Material Design' UI coming to Android, Chrome OS and the web". Engadget. ^ Tom Dawson (October 28, 2014). "Chrome OS to Get New Default Wallpaper Full of Material Design". ^ "Google shares sneak peek of Material Design applied to Chrome OS". July 18, 2014. ^ Konrad Krawczyk (February 6, 2014). "Google reveals $1,000 Asus Chromebox for business videoconferencing". ^ Caesar Sengupta (February 6, 2014). "Chromebox, now for simpler and better meetings". ^ "Chromebase for meetings makes video-conferencing personal and simple". March 31, 2016. ^ "AOPEN collaborating with Google on new retail technology". AOPEN. Retrieved March 11, 2015. ^ Martonik, Andrew (November 17, 2015). "Google and ASUS officially launch the Chromebit, available now for just $85". Android Central. Retrieved January 30, 2016. ^ Vaughan-Nichols, Steven (June 18, 2012). "It's 2016, and Chrome OS is ascendant". Computerworld. Retrieved September 7, 2013. ^ Enderle, Rob (May 12, 2011). "Why Google's Chromebooks are born to lose". Digital Trends. Retrieved September 7, 2013. ^ "Packaged Apps - Google Chrome". developer.chrome.com. Retrieved January 26, 2016. ^ "What Are Chrome Apps? - Google Chrome". developer.chrome.com. Retrieved January 26, 2016. ^ Amadeo, Ron (September 11, 2014). "Chrome OS can now run Android apps, no porting required". Ars Technica. Retrieved January 26, 2016. ^ Klosowski, Thorin (September 22, 2016). "The Google Play Store Is Now Available in Chrome OS, Brings Android Apps to Your Chromebook". LifeHacker. ^ Protalinski, Emil (May 8, 2018). "Chrome OS is getting Linux app support". VentureBeat. ^ Raymond, Phillip (October 15, 2018). "Chrome OS Stable Channel Gets Linux Apps". ^ Samson, Ted (May 16, 2013). "Google entices Chrome OS developers with prospect of native-like apps". InfoWorld. Retrieved June 5, 2013. ^ "What Are Packaged Apps?". Chrome apps stable. Retrieved June 5, 2013. ^ "For Your Desktop". Chrome Web Store. Retrieved January 23, 2014. ^ a b Metz, Cade (June 9, 2010). "Google morphs Chrome OS into netbook thin client". The Register. Retrieved June 14, 2010. ^ Rosenblatt, Seth (August 10, 1011). "Chrome OS goes offline, gets file manager". CNET download.com. Retrieved August 11, 2011. ^ "Stable Channel Update". Chrome Releases. ^ Mathews, Lee (August 13, 2010). "Google Chrome's Remoting feature shows up in Chrome with enterprise implications". Archived from the original on February 7, 2011. Retrieved August 22, 2010. ^ Claburn, Thomas. "Google Pleased With Chromebook Sales". InformationWeek. ^ Thibodeau, Patrick. "Orlando tries out 600 Chromebooks, The Chrome OS-based laptops may fit into city's cloud strategy". Computerworld. ^ a b "Chrome OS can now run Android apps, no porting required". Ars Technica. September 11, 2014. Retrieved September 12, 2014. ^ "The Play Store comes to Chrome OS, but not the way we were expecting". Ars Technica. Retrieved February 22, 2017. ^ "All Chromebooks debuting in 2017 and beyond will run Android apps". Ars Technica. Retrieved February 22, 2017. ^ Whitson Gordon (May 24, 2013). "How to Install Linux on a Chromebook and Unlock Its Full Potential". ^ "You can now run Linux apps on Chrome OS". ^ Zheng, Tim (January 23, 2018). "Add Crostini experiment to field trial testing". chromium-review.googlesource.com. Retrieved April 18, 2018. ^ "Crostini: A First Look At The New Linux Terminal For Chrome OS". chromeunboxed.com. February 26, 2018. Retrieved April 18, 2018. ^ "Google Chrome OS – bullet proof?". Infosecurity. 6 (5): 6. July 2009. doi:10.1016/s1754-4548(09)70096-8. ISSN 1754-4548. ^ "Linux apps on Chrome OS - an overview of its biggest feature since Android apps". xda-developers. April 25, 2018. Retrieved September 4, 2018. ^ "Linux Apps Land On Beta Channel For A Lot Of Chromebooks". chromeunboxed.com. Retrieved September 4, 2018. ^ "Running Custom Containers Under Chrome OS". ^ Steven J. Vaughan-Nichols (March 6, 2013). "The secret origins of Google's Chrome OS". ZDNet. ^ a b c d "Security Overview: Chromium OS design documents". Retrieved November 25, 2009. ^ Messmer, Ellen (March 2010). "Google sheds light on Chrome OS Netbook security". Retrieved March 8, 2010. ^ Paul, Ryan (December 2010). "Google demos Chrome OS, launches pilot program". Ars Technica. Retrieved December 8, 2010. ^ "Crosh -- The Chromium OS shell". ^ "Shell Style Guidelines". The Chromium Projects. Retrieved June 5, 2015. When writing code that is used on developer systems or dev/test Chromium OS images, always use bash. For scripts that are used on the release Chromium OS image, you should be using POSIX shell. ^ "Poking around your Chrome OS Notebook". The Chromium Projects. Retrieved February 6, 2011. ^ "Boot and Install Chromium OS on Notebook". Keyables. ^ "Chromium OS". The Chromium Project. Retrieved February 21, 2016. ^ "The Chromium Projects: Chrome OS". Retrieved July 2, 2011. ^ "The Chromium Projects: User Experience". Retrieved November 21, 2009. ^ Stephen Shankland (April 10, 2012). "Google gives Chrome OS a less alienating interface". CNET. ^ Caleb Garling (April 10, 2012). "Google Chrome OS Busts Out Of Browser With New Interface". Wired. ^ Paul, Ryan (April 16, 2012). "Hands-on: getting work done with Google's new Aura interface for Chrome OS". Ars Technica. Retrieved April 17, 2012. ^ Jazayeri, Mike (April 15, 2010). "A New Approach to Printing". The Chromium Blog. Google Inc. Retrieved April 16, 2010. ^ Heater, Brian (April 16, 2010). "Google Talks Cloud-Based Printing for Chrome OS". App Scout. Retrieved April 16, 2010. ^ Whitney, Lance. "Google moving closer to Chrome OS printing". CNET News. Retrieved April 17, 2010. ^ "b793195a8a91fa9a17eaf4af0fa21fed4da4d9cc - chromium/src - Git at Google". Retrieved March 9, 2019. ^ "Issue 2117713002: Print directly to CUPS using the IPP APIs - Code Review". codereview.chromium.org. Retrieved September 17, 2016. ^ Beaufort, François (January 3, 2014). "We all agree that Dev Channel is great to test out new…". Google+. Retrieved February 22, 2014. ^ Keegan, Victor (July 10, 2009). "Can Chrome steal Microsoft's shine?". The Guardian. UK. Retrieved July 11, 2009. ^ Bertolucci, Jeff (July 10, 2009). "Google, Microsoft Invade Enemy Territory: Who Wins?". PC World. Retrieved July 11, 2009. ^ Bradley, Tony (April 2010). "Five Reasons the Google Chrome OS will Flop". Retrieved April 21, 2010. ^ "OS Statistics". w3schools.com. Retrieved January 3, 2017. ^ "PC Platform is Evolving, Not Dying: Chromebooks and Ultraportable PCs to Gain Volume Market Share in 2016" (Press release). March 9, 2016. ^ Dignan, Larry (November 23, 2009). "Admob: Droid and Android army make big browsing splash". ZDNet. Retrieved December 1, 2009. ^ Patel, Nilay (July 14, 2009). "Steve Ballmer calls Chrome OS "highly interesting," says Google "can't make up their mind"". Engadget. AOL. Retrieved November 28, 2009. ^ a b Levy, Steven (June 7, 2011). "Jobs to PC: 'You're Busted!' And Other Notes From The OS Wars". Wired. Retrieved June 7, 2011. ^ Krazit, Tom (November 20, 2009). "Brin: Google's OSes likely to converge". CNET News. Retrieved November 28, 2009. ^ Olivarez-Giles, Nathan (March 13, 2013). "Google Replaces Android Boss Andy Rubin With Chrome's Sundar Pichai". Wired. Retrieved March 13, 2013. ^ Bohn, Dieter (June 25, 2014). "Native Android apps are coming to Chrome OS". The Verge. Retrieved June 25, 2014. ^ Alistair Barr (October 30, 2015). "Alphabet's Google to Fold Chrome Operating System Into Android". WSJ. Retrieved November 14, 2015. ^ Sam Tran. "Chrome OS Will Be Merged Into Android - OMG! Chrome!". OMG! Chrome!. Retrieved November 14, 2015. ^ Lockheimer, Hiroshi (November 2, 2015). "Chrome OS is here to stay". Retrieved November 27, 2013.